Christine Lagarde has long been suspected of corruption. Yet of course the International Monetary Fund’s (IMF) board proclaimed they firmly stand behind her because she has raised the stature of the IMF to a world player once again. This accomplishment is thanks to Obama and their joint agenda to raise our taxes to 80% and confiscate 10% of everyone’s bank account to pay for the bankers. Christine Lagarde is facing a criminal investigation in France that is tied to a political corruption probe dating from 2008. The allegations by French magistrates earlier in the week placed Lagarde squarely under formal investigation for “negligence” after questioning her in Paris for a fourth time. Under French law, you do not move to a formal investigation without probable cause so it is the effective step under common law (UK/USA) of a grand jury investigation. This arises from allegations that tycoon Bernard Tapie won a large arbitration payout due to political connections when Lagarde was French Finance Minister. Anyone would normally step down to prevent any taint from impacting the IMF. The fact that she does not illustrates the power play at stake. 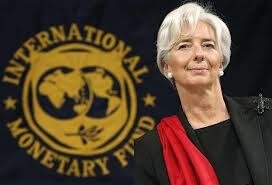 Her lawyers intend to appeal that decision to run the course so her term expires at the IMF by July 2016.